Just in time for Passover, Coconut Pyramids are easy and delicious treats that remind us of the Israelites’ exodus from Egypt. These were originally introduced to me by a beloved family member when I visited her in England. She told me that she made them every Passover. 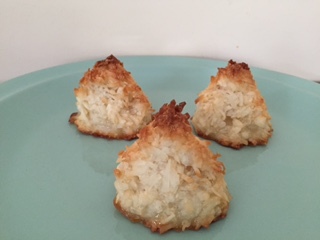 In order to recreate her recipe, I took my “Awesome Coconut Macaroons” and changed them into cute little pyramids! These make a great Passover project with the kids, so have fun. They will also make a great dessert to bring to the Seder if you are a guest. Have a Happy Passover!